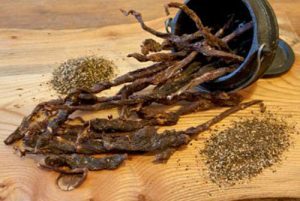 Stokkies (or Stick Skins as known popularly) are nothing but a preparation made out of dried meat with an addition of herbal mixture. Stick Skins fell in the snack category and it is tasty due to the presence of various herbal items. Normally a meat is dried and the spice mixture is added into those twigs. Ground coriander seeds, brown sugar and ground peppercorns are the common items to mix with the meat pieces. Then other items like garlic are added to bring a unique taste. The stick skins not only becomes tasty to eat but equally helpful for the building of muscles due to the presence of various proteins. We all know that proteins are one of the most important factors for building the muscles in the human system and stick skins do supply the necessary amount of protein in this form. Stick skins are truly ideal for you if there is any planning for good health.